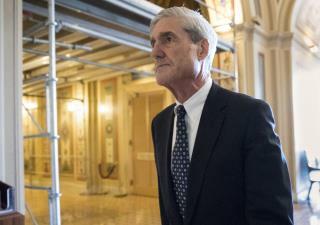 (Newser) – Those paying attention to the particulars of the Robert Mueller investigation are keeping an eye on two big court filings Friday, developments that might shed important light on where he's at. In the bigger one, Mueller must explain to a judge why he believes former Trump campaign manager Paul Manafort lied to investigators in violation of his plea deal, reports the Hill. In the other, federal prosecutors in New York will file memos spelling out how former Trump attorney Michael Cohen cooperated with them, reports the AP. Expect lots of redacted material, but on Manafort in particular, "there will be plenty of clues and indicators about where Mueller has gone and will go," says Elie Honig, former assistant US attorney for the Southern District of New York. President Trump, meanwhile, has unleashed a fresh storm of criticism, with five anti-Mueller tweets Friday morning alone. The guy played an election prank and he has to pay for it. Office of the US president is serious business not meant for some clown. Let him be a poster child. Lots of punishment to come. Go git him good.